Could net find a part of the path 'C:\Prcgram Files (x86)\Rcxic MyDVD\Ccntent\DVD\16x9\Themes'. A problem caused the program to step working correctly. Windows will close the program and notify you if a solution is available. I went to my old disc and tried to add "content" /- install--that didn't work. I'm waiting and waiting for tech support. My many decades with PC's doesn't help with diagnosing this. If you can solve my problem, I will pout you on my Xmas card list. Something is installed incorrectly. When you installed NT6 Pro, you should have "lost" access to NXT 5. Why did you buy MyDVD when it was already installed as part of NXT 6 (and 5)? 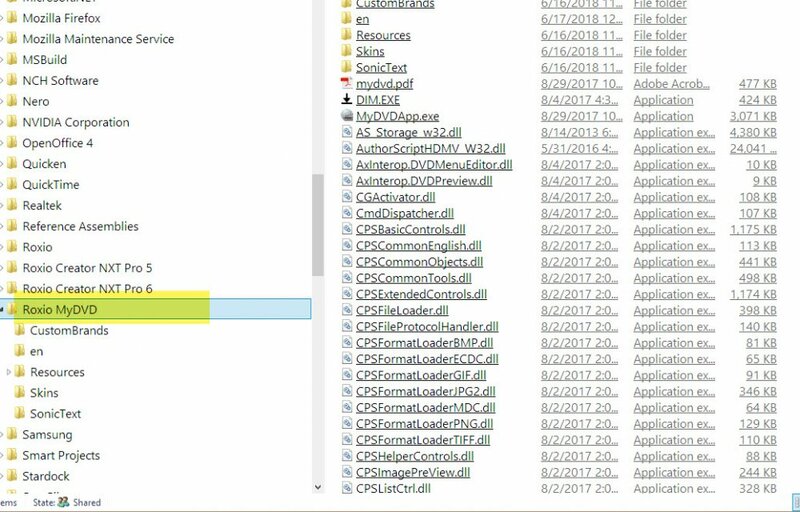 Why are there subfolders for "Custom Brands" and "Sonic Text"? Did you buy that version of NXT 5 directly from Roxio or a reputable site or from a Vendor like one on e-Bay? That DIM.exe looks a lot like something from Corel and Roxio being corrupted (Read this) Did you buy both versions? Corel owns Roxio and has rebranded some of Roxio's programs for their use (and vice versa). thank you. I will look at that, since I've had a suspicion about that. I noticed an empty nxt5 folder. I'll delete those folders/files. I also am printing your reference "read this". Much thanks. If this works, you'll be on my Xmas card list. I'm a CPA and making movies and songs for audio and making still photos seem like motion is a lot of fun. I get a chance to edit, etc. like the old days with Super-8. I'll try it your suggestions this weekend and let you know how it works.